Master’s student at the Norwegian University of Science and Technology (NTNU), Kristin Søiland has done experiments at Nofima’s facilities at Sunndalsøra: “I’ve learned so much from doing research work and getting to see what goes on behind the scenes. There is a vast amount of work behind each test. In collaboration with my supervisor, I’m allowed to shape what we’re working on”. Søiland’s work focuses on measurements – specifically, measuring nitrogen compounds in post-smolt production in brackish water. When a smolt grows to become a post-smolt in a recirculating system, it is common to phase into salt water until it becomes brackish. However, brackish water makes it more time-consuming and resource-intensive to accurately measure the nitrogen compounds in the water using ion selective sensors. This is because other ions interfere with the measurements. Nitrogen compounds such as ammonia can be deadly for fish even in small concentrations, so accurate measurement is essential in recirculating aquaculture systems. 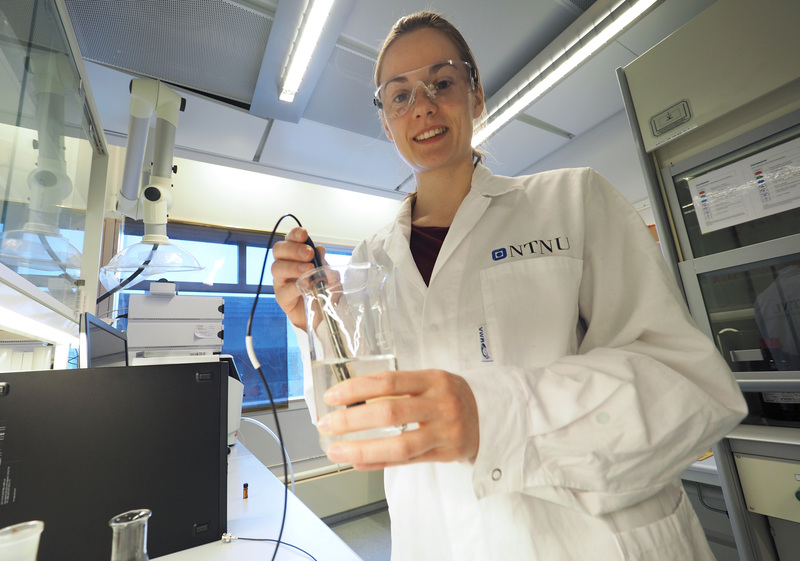 Before Christmas, Søiland was involved in a pilot project where she measured nitrates and ammonium using ion selective sensors at different salinities. In her master’s thesis, the same sensors will be used to log nitrates and ammonium in fresh water and brackish water with the presence of smolt and post-smolt. In addition, she will be looking at biofouling of the sensors. “I’m going to test whether this material, which contains nanoparticles of silver and has an antibacterial function, works on sensors in brackish water,” Søiland explains. The utility value of Søiland’s master’s project work is linked to time and accuracy. “If the sensors are found to be reliable in post-smolt production in brackish water, time can be saved, as it will be possible to measure nitrates and ammonia in brackish water in real time. If the biofilm hoods also work, the measurements will be more reliable,” says Søiland. monitoring is a prerequisite to ensure good management and fi sh health in closed systems.